As ironic as it sounds, it is an out-of-the-box dining concept that requires you to step into a box. That is, a fully custom-designed one that’s built from scratch. “Find your Lucky Star” is truly a one-of-a-kind pop-up restaurant that is currently residing inside Sheraton Imperial Kuala Lumpur. The carefully crafted menus that will be served are by Chef Francois Mermilliod, the owner of Bar-A-Thym in Singapore, as well as Villa Danieli’s very own Chef Gaetano Di Stefano. The artist behind the box – multi-award-winning global interior designer Emma Maxwell. Uber cool and other-worldly, the pop-up restaurant is designed by multi award-winning global interior designer, Emma Maxwell. Every piece is custom-designed or brought in specifically for the pop-up affair, from the bubble cluster-like lights to the mirror-surfaced dining table, which only seats 12. Choosing who you want to dine with at this exclusive experience is of utmost importance, by the way. If possible, book out the whole 12 seats with like-minded friends to truly enjoy the immersive experience. It is as close to dining under the stars as it can get. Pro tip: get your Boomerang cam ready for the shooting stars that fly by towards the end of the meal. 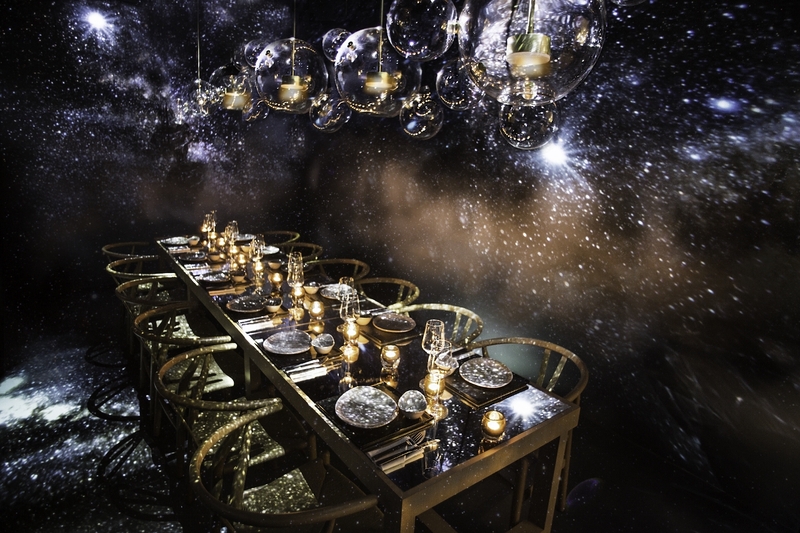 Dining among the stars takes on a new meaning. On the outside, the box is black, adorned with recognisable constellations in gold. Stepping into the cool space, lighting is minimal so you can see the projection of stars all around you. There’s even a specially curated playlist for the experience which you can find on Spotify, titled Find Your Lucky Star by Emma Maxwell. Chef Francois Mermilliod owns Bar-A-Thym in Singapore, so check that out if you have plans to head down south. The restaurant will be serving delicate French cuisine by Chef Francois from 12 – 16 December, and a gorgeous Italian menu from 17 – 29 December by Chef Gaetano. As for us, we had the six-course dinner menu with wine-pairing. There’s also a four-course lunch menu with mocktails option if you need to be functional at the office after. First course – Ceviche of Yellow-fin Tuna. It was a light and citrusy beginning to a meal. The Yellow-fin Tuna Ceviche came with a very enjoyable apple-fennel salad drizzled with yuzu ponzu dressing. Slightly sweet and sour, it worked wonders at stirring up our appetite. Precariously sitting atop the fish was a light, crispy, and perfectly salted piece of fried seaweed that gave a nice crunch. The wine partner of this dish was a 2016 Huntaway Marlborough Sauvignon Blanc, which brought out the yuzu flavour beautifully. Second course – Chilled Lobster Ravioli, guava, lime sabayon and nahm jim. Continuing the slightly fruity palette, the next dish was the Chilled Lobster Ravioli with guava, lime sabayon and nahm jim. We liked this Asian twist to the ravioli concept – it was a smooth and delicate rice paper draped across the generous chunk of lobster and garnished with some salmon roe. The freshness from the shellfish was apparent with a tinge of seafood sweetness complimented by the guava, lifted by the lime sabayon, and tied together by the nahm jim. Vino-wise, it was paired with a 2015 Bonpas Cotes de Luberon Blanc, which brought out the slightly tangy flavours nicely. Third course – Seared Scampi with angel hair, Hokkaido sea urchin and Sakura ebi. Leonardo da Vinci once said that simplicity is the ultimate sophistication, and we couldn’t agree more. The next course was of Seared Scampi with angel hair, Hokkaido sea urchin and Sakura ebi served on a crayfish. In contrast to how pasta is usually served, there was hardly any sauce on the angel hair yet it had fantastic flavour. Texture-wise, the little scampi provided a nice crunch while the sea urchin was beautifully smooth and creamy. The wine-pairing of 2015 J. Moreau and Fils Chablis, was again spot on. Fourth course – Wild-caught New Zealand Grouper with saffron risotto, razor clams and smoked eel broth. Moving on to a strong contender of our favourite dish of the night, the Wild-caught New Zealand Grouper served with saffron risotto, razor clams, and smoked eel broth was really a whole other level. The texture of the Grouper was something we’ve never had before in a fish – it was so fresh that it had a consistency almost like cooked lobster meat. Similar to the second dish, the freshness of the Grouper presented itself as a sweet tinge. Risotto is our weakness, saffron risotto even more so, and this one was c’est magnifique. What made us sit up for a moment and really try to concentrate, however, was the smoked eel broth. Smoky, with a distinct eel scent that wasn’t fishy, it was an interesting new taste to discover. The wine counterpart was a 2015 Capel Vale Margaret River Chardonnay. Fifth course – Milk-fed Veal Tenderloin with foie gras foam, heirloom baby carrot and buckwheat. The star of the night (food-wise that is), was the Milk-fed Veal Tenderloin with foie gras foam, heirloom baby carrot, and buckwheat. Ridiculously tender, the veal seemingly melted in our mouths together with the foie gras foam. It was a creamy, dreamy dish punctuated only by the surprising crunch from the buckwheat. We recommend you put a little bit of everything into each bite for the ultimate oomph. This particular wine-pairing was top notch. The 2015 Capel Vale Margaret River Cabernet Sauvignon slyly carried the foie gras foam flavour onto the tongue, where it bloomed beautifully when swirled together. If you love foie gras and wine, this will knock your socks off. Sixth course – Warm Pear and Raspberries ‘Bourdaloue’ with vanilla ice cream. Because we’re usually wary about capacity when it comes to dessert, it was a pleasant surprise for us to finish the treat entirely that night. The Warm Pear and Raspberries ‘Bourdaloue’ with vanilla ice cream made our hearts sing. Warm, comforting, sweet but not too much so, we loved the pear tart of sorts. The crushed almonds, soft pear, high quality vanilla ice cream, and the occasional zing from the raspberries all melded to produce a sweet symphony on our tongues. Sit back, relax and allow yourself to be transported to another world. The Find Your Lucky Star pop-up by Sheraton Imperial KL will only be here from 12 – 29 December 2017, and you should really catch it if you can. We loved the entire experience, from the other-worldly ambience to the delicious food and wine. If you can, go for a dinner slot where the six-course menu with mocktails is priced at RM388 nett while with wine-pairing it becomes RM438 nett per person. There are lunch options too of course, with prices starting at RM188 nett per person with mocktails, and RM238 nett per person inclusive of wine-pairing. The lunch menus have four-courses only, so it’s not too difficult to get back to work after if you have to. Find Your Lucky Star pop-up, Pavilions Lounge, Sheraton Imperial Kuala Lumpur, Jalan Sultan Ismail, 50250 Kuala Lumpur, www.sheratonimperialkualalumpur.com, +60327179027.